1. In a large bowl, whisk together the spelt flour, baking powder and salt. Set aside. 2. In another bowl, combine the banana, coconut nectar, coconut oil, coconut milk and rum. 3. Add the flour mixture to the banana mixture and stir just to combine. Fold in the coconut flakes. 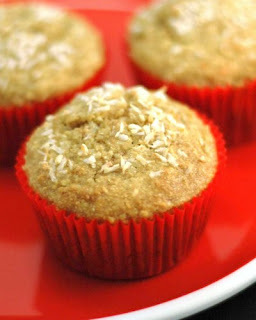 Spoon the mixture into a muffin pan lined with muffin cups and garnish with more coconut, if desired. Bake at 350 degrees for about 20 minutes, or until a toothpick inserted in the centre of a muffin comes out clean. Allow muffins to cool for about 10 minutes before transferring them to a cooling rack. Store muffins in an air-tight container at room temperature.